According to the city of Denton’s interactive oil well map, there are several active oil wells near Hickory Creek, Old Alton Road and the Denton Country Club. One in particular near McKenna Park, though currently inactive, has been deemed a possible culprit for high levels of the carcinogen Benzene. There has been debate as to whether a direct link to Benzene and cancer exists. A document from the Environmental Protection Agency reports an “increased incidence of leukemia” in people who are frequently exposed to the carcinogen. In 2014, Denton became the first city in Texas to ban fracking. However, that ban was overruled by House Bill 40, referred to commonly as HB-40, which reversed Denton’s fracking ban. According to the 2015 bill, Texas cities are only allowed to regulate “aboveground activity,” while below ground activity such as drilling and fracking for oil and natural gas is regulated by the state. UNT geography professor Matthew Fry, is unfamiliar with the presence of the gas in Denton and its affects. Currently, there are no drilling projects being conducted on the 315 wells in Denton, but many are still active due to “reworking activities” which is “work performed on a well after its initial completion to secure production where there has been none, to restore production that has ceased, or to enhance or increase production within the zone originally completed or to repair the well,” according to the city of Denton’s Gas Well Activity chat. “Don’t Frack with Denton,” a documentary made by UNT alumni Garrett Graham, chronicled local activists journey to passing the initial ban. 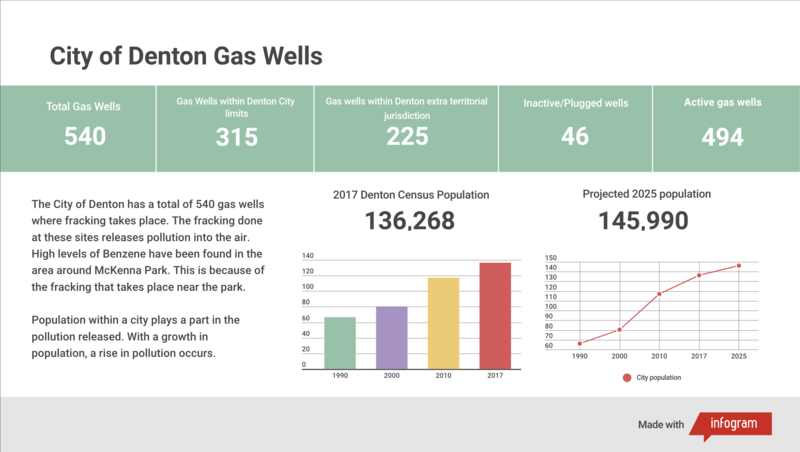 The concerns of health and environmental detriment those activists had are still present as both the city of Denton and Denton County continue to grow in population. Graham said regulatory agencies like the Texas Railroad Commission “don’t care” about possible health risks from air pollution that happens as result of oil wells in cities like Denton, which is located on the Barnett Shale, a region that is abundant with natural gas. The gray areas in determining environmental dangers of these oil wells and the exact causes of them becomes more convoluted when legislation is taken into account. Locally, the city of Denton offers information on their website about mineral ownership on properties and how residents can file complaints about a well near their property, but there is nothing the city can do to halt the activity if it is done within the state guidelines. Graham said the devotion to anti-fracking activism has died down due to time passing and the decrease in active fracking in Denton. Denton has had significant population growth within the last 10 years, ranking 28th in the country for city growth in the 2015-2016 period according to demographics.texas.gov. Fry said the population increases occurred in tandem with natural gas well use. 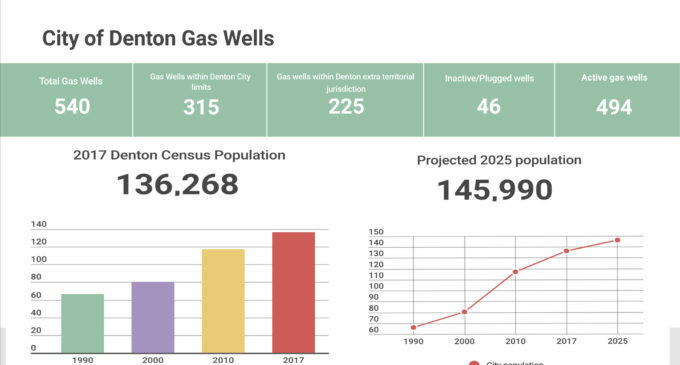 As Denton residency approaches the projected 145,990 in 2025, there is the question of whether new Denton residents will coincide with more environmental activism and possibly provide concrete answers as to the health implications of North Texas’ oil and natural gas industry. Featured Infographic by: Isabel Anes. “Currently there are no ongoing projects” – so isn’t it dishonest in the graphic to refer to ongoing “fracking wells”? Walking down street could potentially cause tornado that would cause death and destruction to all….. Come on. Second infogram is incorrect. Only 315 wells are within City of Denton. 215 wells are in the ETJ and those are under some city regulatory jurisdiction.